On the 10th anniversary of the first massive open online course, they are more numerous than ever. In 2008, University of Manitoba professors Stephen Downes and George Siemens taught a course on learning theory that was attended by about 25 paying students in class and by another 2,300 students online for free. Colleague Dave Cormier at the University of Prince Edward Island dubbed the experiment a “massive open online course,” or MOOC. Since then, this learning mode has been through a dynamic roller-coaster ride. It became an object of much hype (a 2012 New York Times article was titled “The Year of the MOOC”) and then faded from the scene (a 2017 Inside Higher Ed blog post decreed “MOOCs are ‘Dead’”). Actually, on the 10th anniversary of that first MOOC, they’re still quite alive. “The numbers suggest MOOCs are, in fact, here to stay,” said Arshad Ahmad, vice-provost, teaching and learning, at McMaster University and director of the university’s MacPherson Institute for Innovation and Excellence in Teaching and Learning. Dr. Ahmad also teaches a five-course specialization MOOC called Finance for Everyone. There are more MOOCs than ever, and some courses are indeed massive, with enrolments in the hundreds of thousands. They have not disrupted education, as some experts predicted, but they have informed it. “It’s a much more complex story than the hype in 2012 would have led you to believe,” said Susan McCahan, vice-provost, innovations in undergraduate education, at the University of Toronto. Today, MOOCs are allowing universities to reach new learners and they’re having an impact on classroom learning too, she said. “Canada is not exactly setting the MOOC world on fire,” quipped online learning expert Tony Bates, who worked on the survey and is currently a distinguished visiting professor at Ryerson University. He said larger schools like the University of Toronto and University of Alberta have cultivated healthy MOOC catalogues. U of Alberta’s Dino 101, which launched in 2013, is one of the biggest in the country, with over 84,000 students enrolled since its inception. 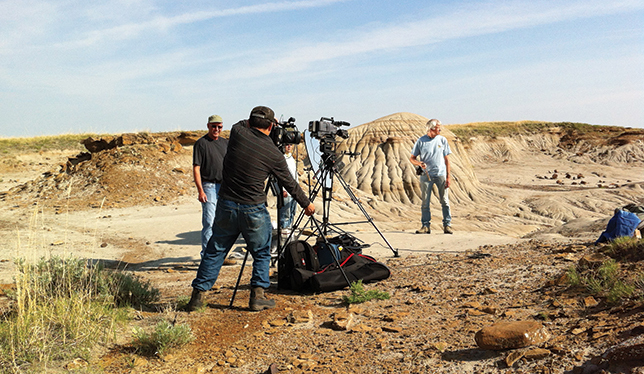 Paleobiologist Philip Currie of the University of Alberta records a segment for the university’s Dino 101 MOOC at Dinosaur Provincial Park in 2013. Photo courtesy of University of Alberta. Smaller universities have also innovated, said Dr. Bates. Learning from Knowledge Keepers of Mi’kma’ki, offered by Cape Breton University, drew in more than 5,000 students when it ran for the first time in early 2016. Many took it for free while some paid $75 so that they could do a final assignment and receive a certificate. In the U.S., MOOCs have gotten increasingly ambitious. Barbara Oakley, a professor of engineering at Oakland University in Michigan, who also holds the title of Distinguished Scholar of Global Digital Learning at McMaster, started her Learning How to Learn MOOC in 2014. It has since attracted over two million registered students, with 20 percent completing the course. In 2015, Arizona State University began allowing freshman students to do a full-year course load via MOOCs offered on the edX platform. “It has moved from one type of institution to being a very different type of institution” that embraces digital learning in a unique way, said Dr. McCahan. While Ivy League schools will invest heavily in MOOC development – Dr. McCahan heard it cost $300,000 to prepare just one course at Harvard University – that’s not the case in Canada. Dr. Ahmad says it took him nine months to develop his five-course MOOC by finding spare time in his busy schedule and getting help from a tech team made up of McMaster staff. U of T now offers grants of $15,000 for professors embarking on a new MOOC, as well as staff support from various university departments to make sure the courses are of high quality. Some universities host the courses on their own websites, while most use commercial platforms like Coursera or edX. U of T uses both these platforms and its agreements with them see it getting 50 percent of proceeds. If a MOOC goes big, there’s money to be made, even if students pay as little as $40. Dr. McCahan said the Data Science Specialization course from Johns Hopkins University had reportedly pulled in upwards of $3 million. “I don’t think anyone goes into these to make money,” said Dr. Ahmad. But MOOCs today can be used to achieve a number of non-monetary goals. Dr. Bates said that U of Alberta’s Dino 101 is “good public relations for them.” Indeed, Global News did a feel-good piece on the course and how a 12-year-old from Scotland completed it. Dr. McCahan said U of T MOOCs like Library Advocacy Unshushed and Aboriginal Worldviews and Education garner much smaller audiences than artificial intelligence guru Geoffrey Hinton’s Neural Networks for Machine Learning, but they have enormous value to the university because they reach new learners, disseminate knowledge and build community. Dr. Ahmad said MOOCs can play a key role in sharing information around the globe for a “global common good,” and also improve access to education for lifelong learners. MOOCs’ deepest value may be in teaching the teachers that create them. Keeping thousands of students engaged in a fully digital format inspires innovative ideas, many of which have value in traditional classrooms. UQTR’s Dr. Bachand, who took a MOOC on songwriting before developing one himself, likes a common MOOC technique of letting students retake quizzes. (The questions get digitally randomized so it’s different every time.) He now runs his in-class quizzes the same way. “Those kinds of quizzes are not meant to rank you. It’s another way of learning,” he said. Because of the sheer size of MOOC cohorts, and their reliance on forums and peer interaction, instructors get real-time feedback on lectures and tests. When you teach a regular course, it can take years to work out all the kinks, whereas with a MOOC, “you can do it in three weeks,” said Dr. McCahan. Students can be taking the course from anywhere, so MOOCs force design teams to think globally. Athabasca University uses a low-bandwidth platform and inquiry-based instructional design to reach educators in the developing world with the Commonwealth of Learning. MOOCs woke up people regardiğng online . Thanks to Daphne Koller of Stanford University. ONLINE by top schools just woke up people . Can you imagine take courses from Harvard, Stanford, Yale, MIT online . No . Now it is an free too . Now here is my solution to HE in the USA. Hign quality schools are expensive due to delivery system . 1.- There are enoıugh nhigh quality universities in the USA I say 200 with 5 million enrollment . 2.- Now there is a better tool for delivery , online cost of it 10 % of the classical one .Even less . 2.- Charge people only 80 % reduced tuition . Real cost is less than even 10 % . Then these 200 high quality schools can increase their enrollment to 15 million . 5 million f2f + 10 million online programs . everybhody bwho is willing to go to college can go , no money problem . 1.- We may lose some existing f2f students . Yes but only 5 % or so . 2.- We may lose our prestige as a top school in the world . No on the other hand you gain lots of recognition in the world . Have online graduates the same quality ? Not really . But not bad either . Sure these extra 10 million will not have the same SAT scores of around 1.000, so their quality may be a little low . But no problem . Not all jobs require Harvard talents .. Please , DOE + Federals + media think about it . It is very easy, no money is required . Just wisdom needed .